There are nearly 2000 different types of credit card available in the UK alone so it's no wonder that people are snapping them up left, right and centre. The pros of credit cards are obvious to see straight away - it's like having free money! They are accepted nearly everywhere, for the most part they're insured if stolen, and if you lose your purse with a credit card in there is a good chance you won't lose any money - whereas if you're carrying cash you're unlikely to see it ever again. With some cards you also get insurance on larger purchases and protection from online fraud- not to mention a period of around 60 days where you pay no interest on your purchases, so that's good too. The cons are sometimes harder to see, hidden away in the terms and conditions - but don't be fooled, they're there all right! The APR is the Annual Percentage Rate (APR). This is what they charge for lending you money. It's the total that you'll pay each year, including the interest rate and any other charges your particular card ties you to - such as an annual fee. Many credit card providers put forward what are known as 'teaser' rates. They might even charge 0% for the first 6 months of the contract. Because after the introductory, or 'honeymoon' period, the rate will go up to the standard rate - usually somewhere between 12 and 20% depending on the provider and the type of card you have. Comparing rates is a good idea, but it's not just the introductory rate you need to take into account unless you plan to pay off the card balance in full each month, or before the end of the introductory rate. If that's what you are planning to do then a card offering 0% interest for 6 months might be perfect. Also take a look at cards that give you cash back deals or rewards for using the card - if your balance is paid each month you won't pay interest anyway so the rate won't matter. If you're planning on using the card long term - say to consolidate other credit you have or transfer balances, then you need to check both the introductory rate, how long it lasts for and what the standard rate is. If you’re planning on staying with the same provider once you have transferred your balance and you want a card for general use, then you might find that rather than taking a nil interest rate followed by a higher standard rate, taking a slightly higher rate at introduction followed by a lower standard rate works out better for you. However If you have an amount that you are happy to keep transferring, keep an eye on the market and plan to move the balance again once your introductory offer has run out. This way you can pretty much constantly be receiving 0% interest on your debt which can really help you to pay it off quickly. Only do this if you can be sure that you won’t get into trouble by maxing out the account you opened to help you pay it off quicker and end up with more debt, rather than less. When you are taking out a new credit card or are changing card provider make sure that you read the small print. Many people are caught out because they don’t realise that while their balance transfers attract a special rate of 0% interest for the first 6 months, their purchases attract a much higher rate. It's also common practice for credit card providers to use your repayments to pay off any instances of your new higher rate first, so you think you're paying off your transferred balance but in actual fact a large chunk of your payment is going on the higher interest rate while your transferred balance stays the same. Before you sign up, see if there are any 'hidden charges' such as annual fees . Before signing up for a card, make sure you check the all important 'fees and charges' list. 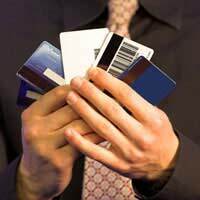 Credit Card providers vary hugely in the penalties they impose for late payments, bounced direct debits, and excess borrowing, as well as charges they make for using your card for foreign transactions – so make sure you know what you’ll be charged if you miss a payment or take your card on holiday with you.